The MILANO semi-flush mount features a sleek chrome finish. This contemporary piece includes a white fabric barrel shade matched with a frosted glass diffuser that is perfect for your living and dining room. A vintage shaped clear glass shade is paired perfectly with a modern dark bronze finish to make Globe Electric's Lucerne Semi-Flush Mount Ceiling Light perfect for a hallway, entranceway or bedroom. This piece gives a subtle sophistication to any area it is placed. An exposed bulb allows you to change the look of the fixture at any time by adding different vintage Edison bulbs. Check out Globe Electric's assortment of designer vintage Edison light bulbs to find the perfect one for you - an S-Type Squirrel Cage Vintage Bulb completes the look. Add light and style to your home with Hampton Bays Flushmount Ceiling Fixture in Pewter Finish. This traditional style ceiling flushmount will bring a welcoming atmosphere to your home. The distinct, decorative holder and detailed frosted glass shade emit a comforting, radiant glow ideal for your foyer, hall or bedroom. A fashionable antique brushed nickel finish combines flawlessly with satin etched shades, making this Sea Gull Lighting ceiling fixture sleek and sophisticated, while the energy saving bulbs make it practical. The 60 watt bulbs give off the ideal amount of light for any indoor application. If you are looking for a bold, new age accent for your home look no further. Milano 3-Light Semi-Flushmount Fixture with White Fabric Shade and Frosted Glass in Chrome The MILANO semi-flush mount features a sleek chrome finish. This contemporary piece includes a white fabric barrel shade matched with a frosted glass diffuser that is perfect for your living and dining room. 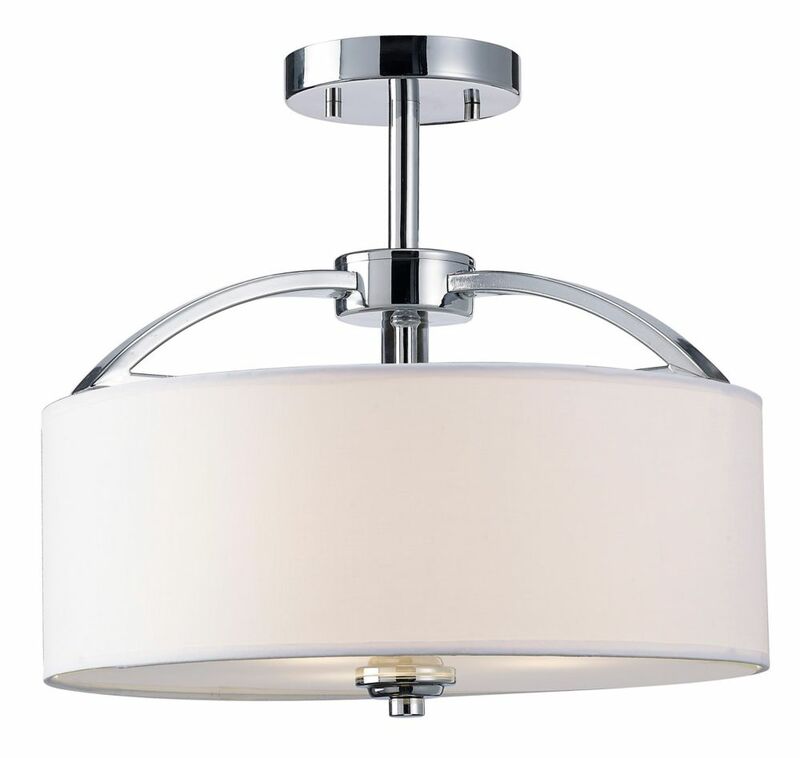 Milano 3-Light Semi-Flushmount Fixture with White Fabric Shade and Frosted Glass in Chrome is rated 4.4 out of 5 by 9. Rated 5 out of 5 by Jo Covalcic from Stylish and contemp looking Love it! Looks good and bright and inexpensive! Easy to instal! Rated 5 out of 5 by Deborah from Very attractive A very attractive ceiling lamp, good quality and very good price. Thanks! Rated 4 out of 5 by HDard from Easy install Attractive and easy install. Very good value for the price. Glass plate didnt quite sit flush but close enough where it shouldnt be noticed. Rated 5 out of 5 by S24S from Great look, great value We bought this light about 3 months ago and it looks fantastic. Easy to install and for the money it cost it truly is a great addition. Rated 5 out of 5 by Mlove from Looks sharp Great light. Easy to put together. Looks clean and sharp. Gives off a nice warm light. Rated 4 out of 5 by vickster from Pretty, but... This fixture is pretty, but up close the chrome looks cheap (can't tell when it's hanging). We also can't get the frosted glass diffuser to sit centered and in fact the entire fixture is 1/4 inch crooked (looking at the photo on the website, theirs looks a little crooked too). We can't straighten it, I don't anyone will really notice though. Rated 5 out of 5 by clumsythief from Great design, doesn't look cheap, easy to the. I used this for my daughter's nursery. Works nicely, looks great. Adds a lot of light since it had 3 bulbs (but I also have a dimmer switch).